See the original post here (below is a complete copy of the original). Last week while at the Farm, I was chewing over the potential crops and uses for the several acres of cleared land behind and beside the farmhouse. After going over the typical list of crops such as corn or potato I looked up to see a dilapidated fence, or rather fenceposts, in the field across from me, so why not try replacing this fence with a trellised plant such as grapes? Why not grapes? And grapes lead to one thing, at least in my mind, and that is wine. To place a small vineyard on the farm seems like the natural conclusion of my prerequisite criteria for an optimal crop since it is perennial, valuable, takes well to low-maintenance, and it something I can certainly get into. Since this realization I have been doing my homework in terms of researching the potential for our farm to host an active winery, and this is my findings. Location of proximal MA vineyards to the Farm. First I needed to look into the process itself and whether it would even be possible to grow wine grapes in a climate such as western MA. 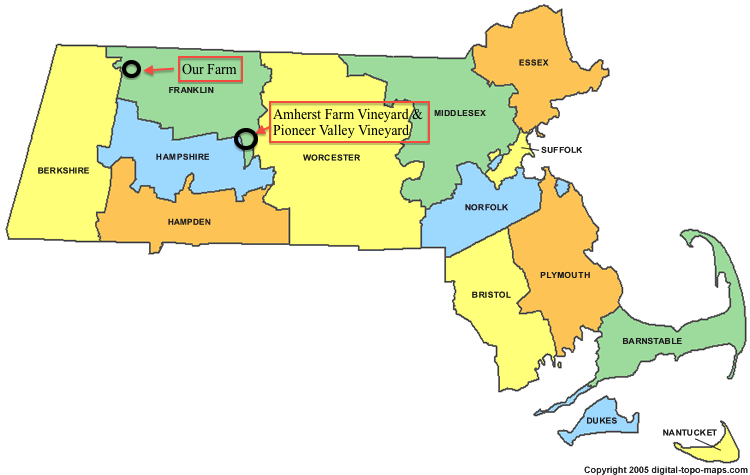 While it has been a struggle to find vineyards in the region there are a few [Amherst Farm Winery] and [Pioneer Valley Vineyard] but both are a fair bit further east and a bit more south than the Farm. Nevertheless on the Pioneer Valley Vineyard web site they specify the varieties that they grow and how cold tolerant they are. Both Landot Noir and Cayuga White are frost-tolerant and grown in what appears to be similar environments. Landot Noir was developed for Minnesota and has been found to grow well in NH, I believe; while Cayuga White was developed for Cornell, NY. With this information I then started looking into the supplies and the winemaking process itself. There are tons of resources for an aspiring at-home winemaker while made for an easy search. One resource that I think will come in quite handy in organizing my materials search is an inventory list for a “High End Home Wine Making Operation” found here. Although this one is priced out of my dollar range–at least for now–it does give a sober impression of some of the materials and equipment needed for a practical winery. Using there list as inspiration will help my in crafting my own. Another critical resource will be simple YouTube videos created by some of the smaller wineries which show the process itself–you can clearly see all the supplies they use. Here is a cheesy-yet-useful video series I found put on by Lakeland Winery. I clearly have a lot more to read-up on in the business side, but I have no doubt that there are innumerable resources out there to help me in this endeavour.